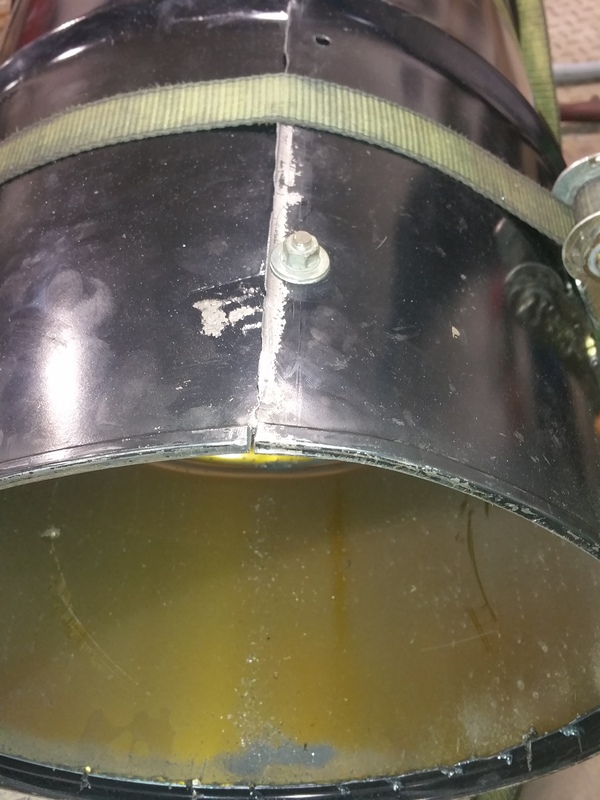 Resizing barrels for a charcoal gasifier and retort - Charcoal Gasification - Drive On Wood! Probably just going to have to go out and buy the smaller drums. But thought I would see if anybody had any success with this first. I’ll be here for a little while tonight if anybody wants to get on chat and see what I’m doing live. Don’t expect much I’m just tinkering. I think my drums were 20 gauge and I welded them with my chinese flux core. it was a challenge though. Later, I did a little experiment with putting a resistor in between the work and ground clamp to cut down the heat a little. It worked ok on some 22 gauge banding. The “resistor” consisted of a piece of wire hanger a couple feet long. I could play with the heat by using more or less of the wire’s length. You might try drilling some small holes through the overlap about ever 6 inches . Take some small bolts and pull the overlap areas together . 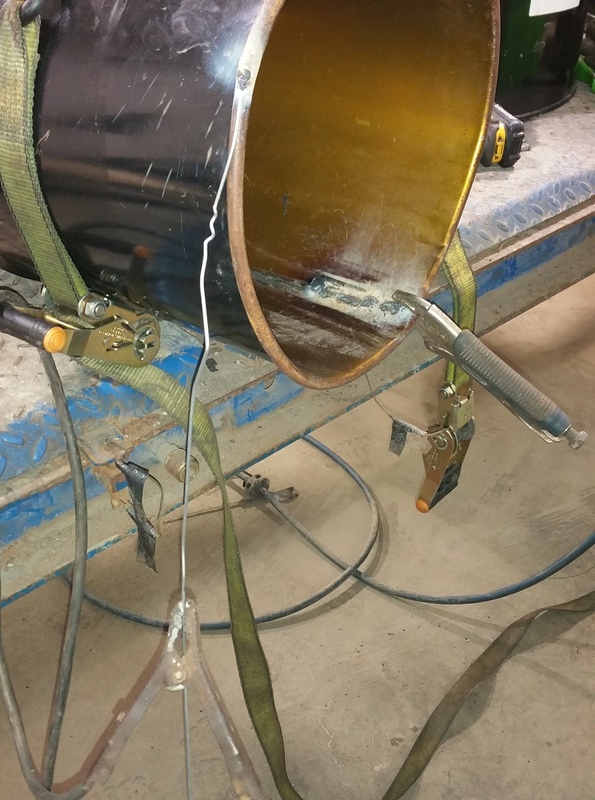 Tack weld and use two hammers ( one in the drum and the other on the outside of the drum ) to pull the material together for welding . Its working proofs in the picture. 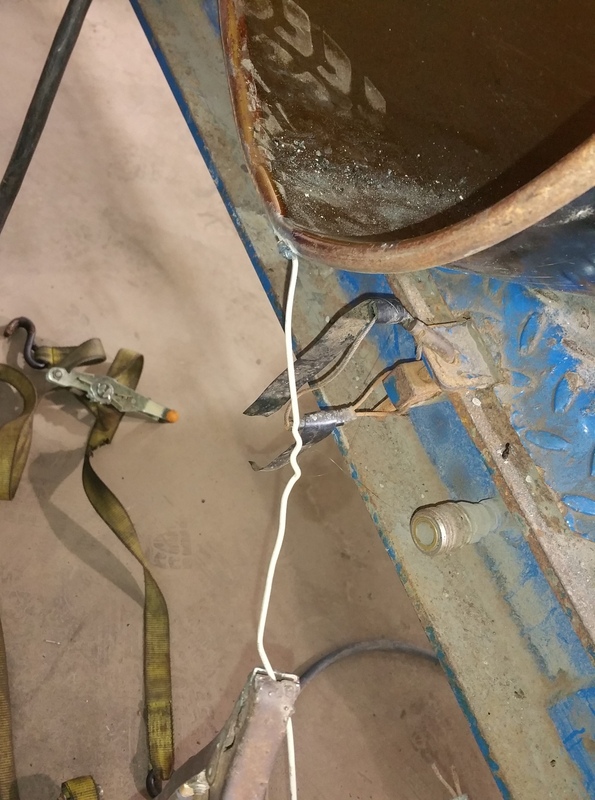 My welder is set at 30 amps and 8 inches of coat hanger. not the prettiest weld in the world but I’m just going for functionality right now. Bolt holes filled in easier than I thought. This will be my extended exhaust for the retort. Welded a lot of barrels with gas torch and fence wire filler. Relaxing job. I use a low pressure torch. I use a low pressure torch. It welds some stuff nice. 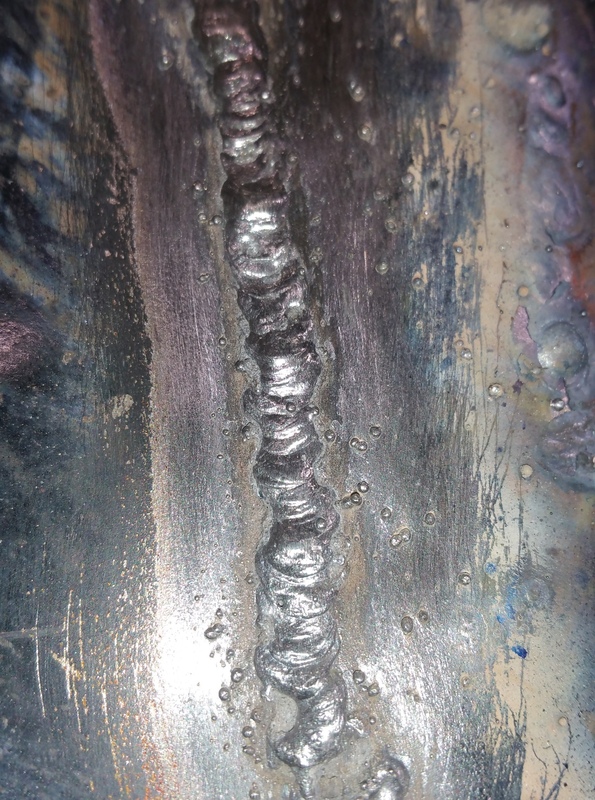 Thin stuff with a but weld. It doesn’t cut like plasma… At least not for me. I like a standard torch for cutting. Hi Robert, That is a real interesting tip Andy showed you using the wire resistor and glad it works, Will have to file that one away! Kind of wonder why you feel the need to resize the barrel though. Unless you do not have two 55 gallon barrels of the same diameter? 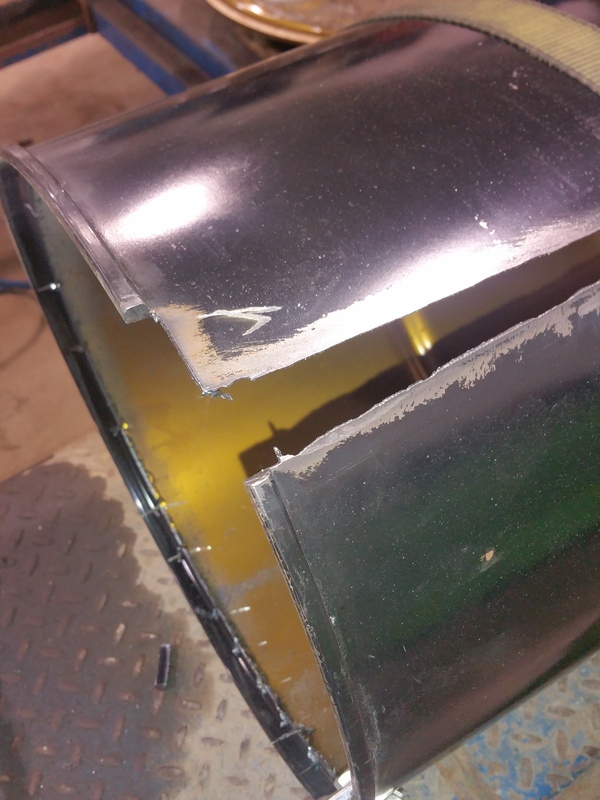 What you picture will definitely work but just wonder why you’d go to the work of cutting and rewelding another barrel for an after burner. Everything I have right now is 22 gauge 55 gallon barrels. I decided to go ahead and cut this one for the afterburner just for the practice. Putting another afterburner drum of the same size on top definitely would have been easier. But the afterburner doesn’t have to be anything perfect and I figured if I practiced on that then my wood basket might be better. so far, the best way I found to splice these is just cut a little bit of the ring out of the top and the bottom and then overlap from there. Then I used my very big, old and cherished Ford wrench to tweak the angle just a little. I learned to weld with a torch, oxygen and acetylene. I have a set of Blue Point torches and regulators but no gas tonight. This is where I have to stop tonight. Wood basket is almost done. 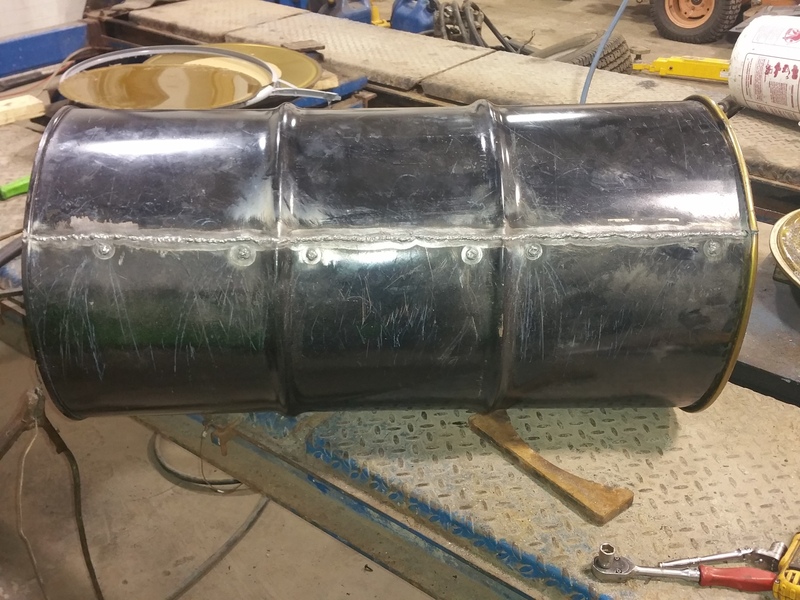 Still have to weld the bottom on and make holes. 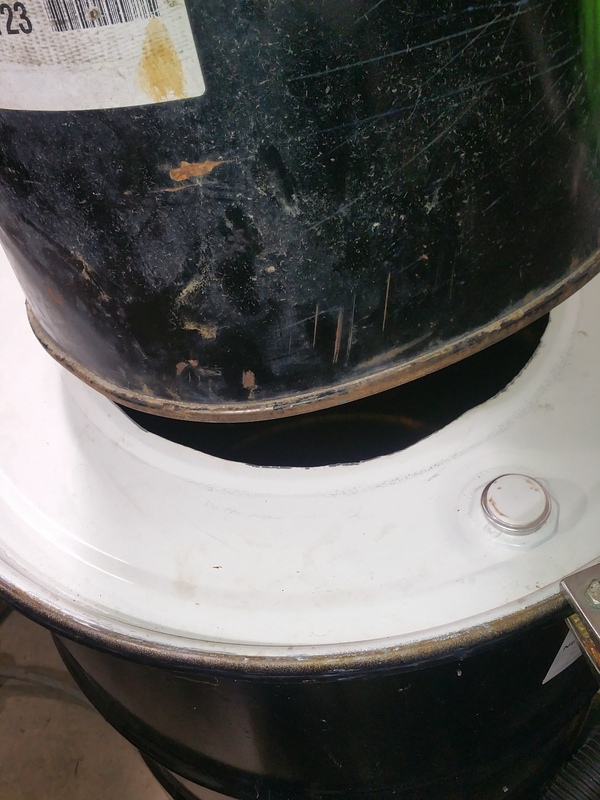 I’ll have to cut the top off a little too so it can fit with the ring into the 55 gallon drum. I think I have some black pipe at home that I can use for this. I believe its 2 inch pipe anyway. Don’t have a valve like Gary does but would a regular screw on cab work? I’ve got one too. Not used it to weld much but it’s handy for cutting thicker steel. 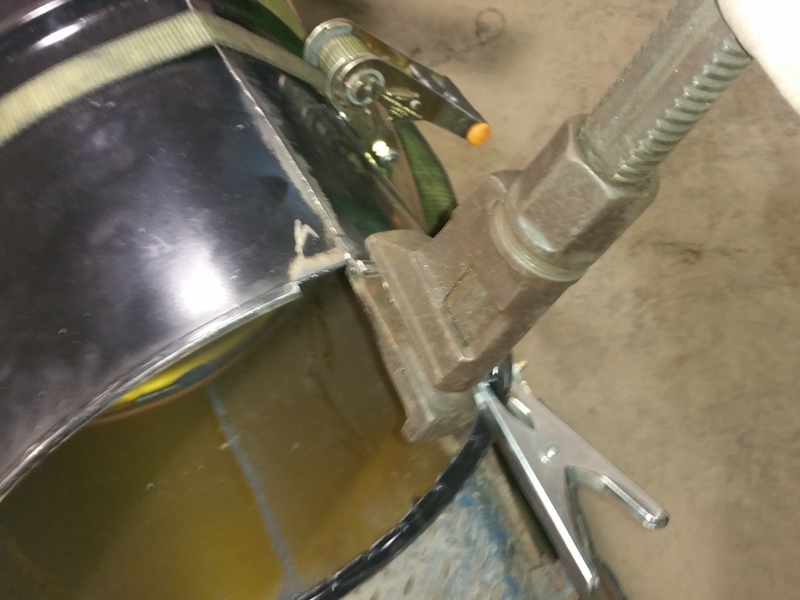 OK, got what you are doing, Just an aside, you do not have to weld the barrel. Simply overlap the ends, and use steel pop rivets to hold it together. 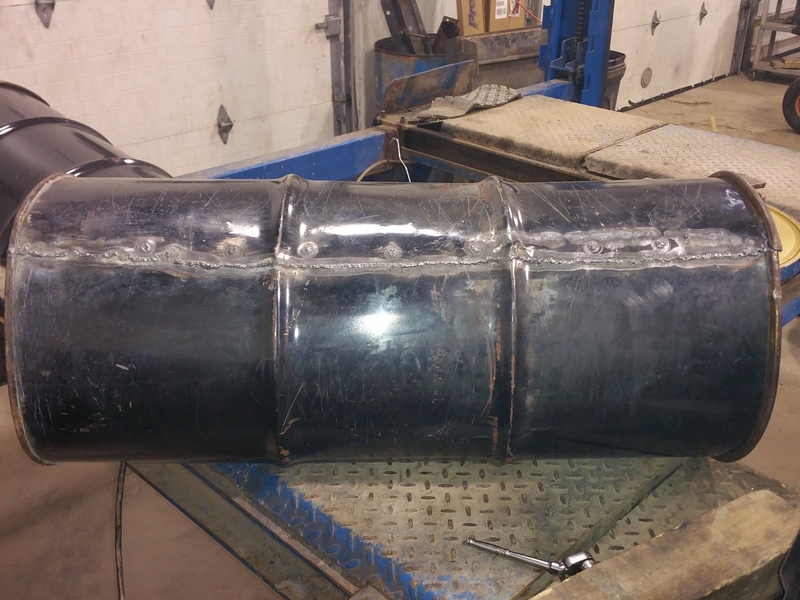 Looks like you are getting good at welding though! The valve for controlling air is nice but not necessary, You can use a cap or even plug the pipe with a wet rag or fiberglass insulation, Love you monkey wrench! I’ve got one too and find it a useful tool. I realized about halfway through that all the welding was not necessary. Oh well. I’m really glad for the experience I gained. I’ve got about 12 feet of the one and a half inch pipe laying around. Will one and a half be enough or should I double up? ( put 2 intake pipes on) or should I just go out and buy a 2 inch pipe? 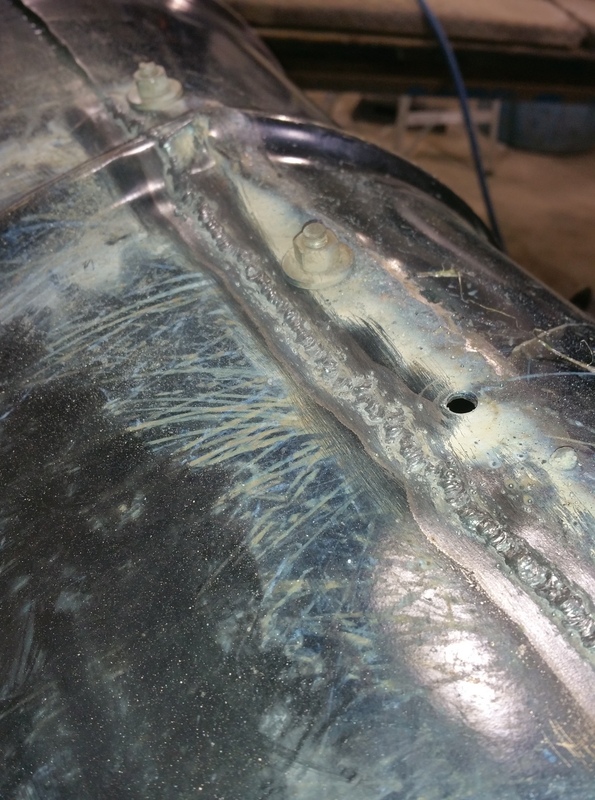 I too, learned first with oxy acetylene and sometimes still go back to it when I get frustrated with the flux core. gas has gotten so expensive though that I cringe every time I open the valves.